The making of baseball bats, tennis rackets, golf clubs, footballs and other kinds of athletic equipment has become a big industry in Chicago. The value of athletic and sporting goods annually distributed through Chicago’s many channels is conservatively placed at $10,000,000, while by some It is estimated at a much higher figure. Chicago is the greatest center in the world for the production of baseball bats, turning out a million a year, and furnishing them to every civilized nation. In the production of strings for tennis rackets, formerly furnished. almost exclusively by England, Chicago now leads the. world. 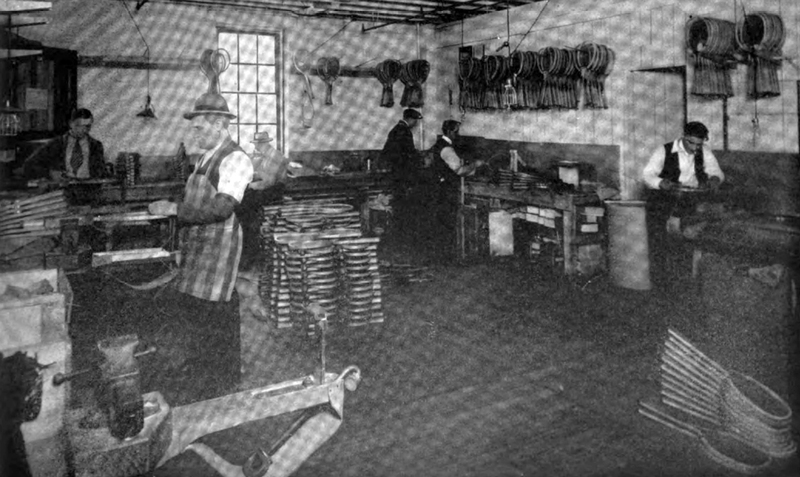 Leather goods, knit goods, and athletic and sport clothing are also made in vast quantities in Chicago, although exact figures are difficult to give for the reason that many of the factories making them also make other goods not classified as athletic and sporting goods, which cannot be separated from the latter. Photo courtesy of Thomas E. Wilson & Co.
skates, 200 tons of cotton cloth for tents, 5,954 footballs a week, 5,000,000 fishhooks in a single order. and 60,000,000 rounds of sporing ammunition a year. 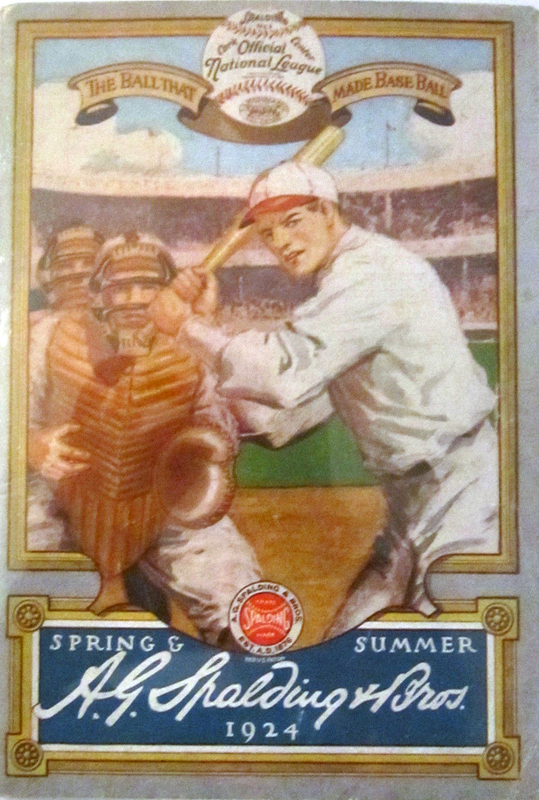 America’s quota of athletic and sporting equipment has greatly increased since the war. The years 1918 and 1919 saw $2,183,486 and $2,903,305, respectively, of manufactured goods in this form of merchandise exported from the United States to all four continents and to many of the far isles of the sea. The prewar census· of the United States gave the number of persons engaged in the industry as 6,318 in 1914, and the total value of the products, as increased by manufacture. in the neighborhood of $20,000,000. In view, of the growing foreign demand and our own vastly increased interest in athletic sports, it is safe to say that these figures are entirely inadequate to represent this great industry and that the new census’ will show a decided advance in what is after all an industry that makes for the health and morale of the nation, and serves to unite our interests in a most desirable way with our fellow sportsmen across the water. the several factories where they are made. Baseball bats are made of ash wood. The timber, cut into blocks, is piled in the yard of the factory in Chicago to season from one to three years, a million blocks at a time helping one to visualize Chicago’s annual output. All high-priced bats are hand-turned. Those made by machinery are turned on a lathe fitted with knives adjusted at a given angle for each model. When duly finished, and, in the case of professional bats, given a taped handle, a forest of bats-in natural finish, dark brown, or mottled brown and yellow-is seen gathered into great racks. ready to start for anywhere in the world, for America’s game is rapidly becoming international. Photo courtesy of A. G. Spalding & Co.
To a lover of golf, nothing could exceed the interest of seeing golf clubs made except the interest of using them. The mysterious sympathy that seems to exist between a good player and his clubs is in part explained when one has seen the patience, the finesse, the down-right,. fondness displayed by the men who make golf clubs. Like a good violin a good golf club has had put into it something which a good player will discover and draw out. The art of selecting timber in the rough that wiII produce good golf club shafts is in itself a scientific work, as only a close grain, second growth hickory with a certain necessary toughness and rugged durability will meet the requirements, and such trees have to be selected individually. After cutting, the trees must season for two years. The heads of wooden clubs are made of persimmon wood from the South, that wood being akin to hickory in its toughness, hardness and ability to withstand sudden contact with great force, while at the same time exceedingly fine in fibre. The iron head is then ground down, first over a hard emery, probably a number 60, and then over a finer one, say a number 120. It is then put through a screw machine which puts flutings into its base and bores a hole in it to retain the shaft. The process of polishing is very thorough-going, being done first with a 150 grease wheel, then with a color wheel, and finally with a buffer. If the club is to be shipped out complete, the head is mounted on the shaft before polishing. The making of wooden club heads is fascinating to watch. On one side of the machine is seen an oblong block of wood slowly revolving between two horizontal points, somewhat as a fowl is turned on a spit before the fire. The block of wood is being carved as it turns, as if by an unseen hand, into the irregular, but scientifically shaped head of a driver, brassie, or spoon, as the occasion demands. The secret of this almost uncanny effect of the block of wood taking shape before one’s eyes, is revealed when, on the .other side of the machine-technically called a lathe-one sees a metal model of the club head, over the surface of which glides a wheel, conforming to its every curve, and transmitting its motion to another wheel, the rim of which is equipped with little curved knives set at different angles for different club heads. This latter wheel revolves so fast that the eye can hardly see it, and, following the motion of the guide wheel, carves the block of wood into a club head, an exact reproduction of the metal model. machine cuts in the face of the club head the “face space” ready for the fibre or ivory insert, which is then put in place and held by hickory pegs. Retaining holes are bored in the neck of the wooden club head to form a shaft socket. The planing down of the shafts of clubs is a matter of great nicety, as the balance of the club in play depends largely upon the thickness of the base in proportion to the neck of the shaft. At a long bench a number of men stand, each with a slender stick of wood held in a vise before him. on an oblique line, so that he can plane along its whole length with one forward impulse. Again this process is a question of trueness of eye and sureness of hand to put just the right taper into the hickory stick so that it will serve for a driver, a brassie, a midi ron, putter or other shaft as the case may be. After planing, the shafts are case-hardened or “steeled” by passing them through the fire of a gas furnace. One realizes the importance of this operation by noting the rigid attention to business of the craftsman to whom it is entrusted. As each club-shaft comes from the Aame, he sights along it to detect any tendency to warp, about as a boat builder sights along the lines of a canoe he is building. We were aware that although our party of several persons stood very close to this man he never turned so much as an eyelash from his task. The leather grips go on the handles of the clubs over a layer of listing to cushion the grip. The leather is cut in strips and wound on, glued, tacked, and fastened with twine. 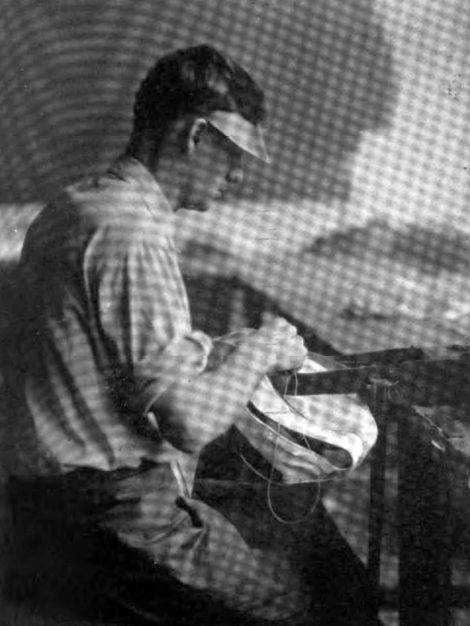 The final finishing of the clubs is done in a special room and includes a series of operations, such as staining, sanding, shellacing, varnishing, rubbing down for “cabinet” or “piano” finish, and lastly stamping and “facing” the heads of the clubs. The finished clubs are then carefully inspected, neatly sacked, wrapped, tagged and dispatched to their final destination. The frames of tennis rackets are made of second growth ash, grown in Vermont. They are bent in the East, finished and strung in Chicago. The strings are prepared through a series of processes such as cleaning, splitting, looping, spinning, drying and polishing, which take in all a week’s time. Each string is tested for tensile strength, and the best must bear a weight of 100 pounds without breaking. The actual stringing is accomplished by fixing the frame firmly in a vise and lacing the strings through the rim. The lengthwise strings are put in first, each one being pulled up tight and held with an awl until it can be tied at the base after all are in. The transverse strings are then put in, darning-wise, in the same way. The strings of one tennis racket require 1,000 feet of the raw material and it takes six Iambs to provide it. 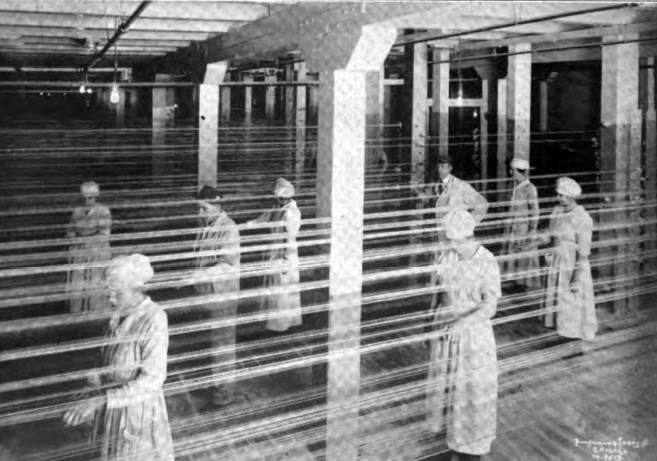 One of the strings is 21 feet long and the other III feet long, after passing through the various processes. It is obvious that the performance of each racket will be conditioned by the excellence of its materials and the way it is strung. A football is made up of four elliptical sections, each of which is lined with canvas. A workman takes two of these canvas-lined sections and stitches them together on a stitching machine. The double thicknesses at the tips of these sections is then hand-sewn by another workman. The two other sections are stitched on, the ball turned inside out, and a rubber bladder inserted through the slit, which is then laced together with rawhide thongs. The bladder is next inflated, and we see the football as it appears in the field in play. Baseballs of the better grade are made with a core of rubber or cork, wrapped with the best obtainable grade of wool yarn, much care being taken to have this winding even, and over all the horsehide cover is stitched by hand. Other grades of baseballs vary in the quality of yarn, etc., which enter into their makeup. All are tested for perfection of form, the standard being that of a perfect sphere. On account of the rubber used in baseballs and certain conditions in the labor market, baseballs are made in the eastern factory near the center of the rubber industry. The Middle West, with its level ground, is the natural home of the national game and Chicago is its center.